1. Combine porcini and hot water in a small bowl. Let stand for 30 minutes. 2. Strain, reserving the liquid. Rinse the mushrooms well under cool water; drain and chop finely. Strain the reserved liquid through a coffee filter or paper towel to remove any sand or dirt. 3. Preheat oven to 425 degrees F.
4. Heat 2 tsp oil in a Dutch oven or large ovenproof high-sided skillet over medium heat. Add leek and the porcini; cook, stirring often, until the leek is tender, 2 to 3 minutes. Add rice, garlic and thyme; stir to coat well. Add wine and cook until almost all evaporated, 2 to 4 minutes. Add broth and the reserved porcini liquid. Bring to a boil. Cover the pan and transfer to the oven. 5. Bake until the rice is just tender but still has a little resistance and a creamy consistency, 40 to 50 minutes. If the risotto seems soupy, place it on the stovetop over medium heat and simmer for a few minutes, stirring, until it reaches the desired consistency. 6. 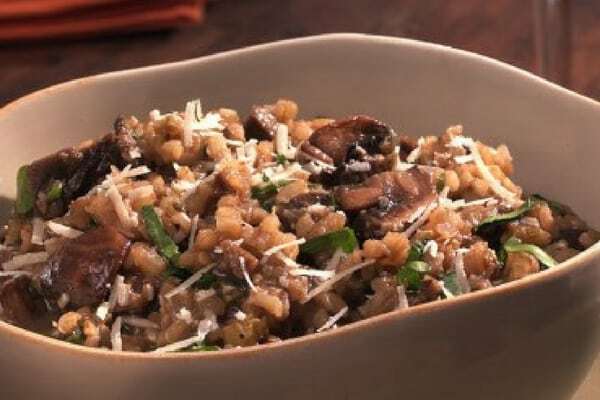 While the risotto is baking, heat the remaining 2 tsp oil in a nonstick skillet over medium-high heat. Add cremini and cook, stirring occasionally, until tender and browned, 5 to 7 minutes. 7. When the risotto is ready, stir in the cremini, Parmesan, 2 Tbsp parsley, vinegar, salt and pepper. Sprinkle the remaining parsley on top and serve immediately.